If you have a ferret, you know how playful and smart they are. Ferrets need a variety of toys for enrichment and fun. They need toys to keep them busy and to arouse their natural problem solving abilities. Toys also act as a type of therapy for your ferret. If a ferret is bored or unhappy, it can lead to undesirable behaviors. When he has fun and interesting toys to play with, he will be less likely to look for other outlets to relieve his boredom— such as digging in his litter box, or getting into things around the house. What kind of toys are the best for my ferret? Ferrets generally love toys that stimulate their natural, instinctual behaviors – hunting, digging and tunneling. Like cats, toys that move in some way challenge their hunting instincts. Many cat toys are also of interest to ferrets. These types of toys include toys on springs, cat teasers, and battery powered toys. Tunneling and burrowing never gets old. Ferrets can run around in tunnels and tubes all day–the more tunnels, the better. There are many different types of tunnels and tubes. To learn about some of the best options see this article. Toys that make noise are also interesting to ferrets. Balls that jingle or rattle and toys that make crinkling sounds are often favorites. One of my ferrets, Panda, loved toys of all sorts. She was quite possessive of them. Some of her favorites were small plastic cage cat balls with bells inside. They are light and easy to carry. When I rattled one of her balls, she would come running, grab the ball and run off with it and hide it so I couldn’t find it. Squeaky toys can also be especially intriguing for ferrets. The sound of a squeaky toy may remind a ferret of the sound of a kit crying or a predator attacking. Hearing this sound usually brings a ferret running to the noise. Because of this behavior, it is a good idea to train your ferret to come running at the sound of a squeak toy–it could save her life someday. I would recommend always having a few of these toys around to call your ferret, but it’s not a good idea to make these regular toys. It may be too stressful for your ferret. Due to their high level of intelligence and natural problem-solving abilities, ferrets also need toys that stimulate their minds and provide enrichment fun. 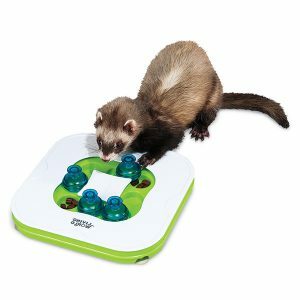 Toys that present a puzzle to solve provide valuable enrichment for your ferret. One popular ferret toy idea for enrichment fun is the Teach & Treat toy. It has 3 different levels, so it’s 3 toys in 1. The toy has 9 separate cups. You can fill one or more with a healthy treat (such as a small piece of cooked chicken). Level 1 requires your ferret to slide a plastic disk around the puzzle to uncover the treat cups. Level 2 requires him to remove hollow knobs covering the treat or treats. Level 3 requires him to move the knobs away from hidden treat or treats. The knobs slide around the snap-in center piece. I have a ferret who loves this toy. Even after she learned to solve all the puzzles, she still enjoys it when I bring it out for her. I would suggest looking at the 3 puzzles and picking out the one that you think would be easiest for your ferret solve first. It’s not necessary to do the puzzles in the recommended order. Hunting, digging and tunneling, making noise, problem solving–toy ideas for enrichment fun. 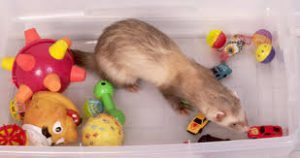 You can try out different toys and types of toys to find what your ferret likes the most. And be sure to give him a variety of toys so he doesn’t get bored. Make sure any toy you give your ferret is safe. Avoid purchasing toys that are made from soft rubber or latex. Pieces of these types of toys could easily be ingested and cause blockages. Do not give your ferret any toys with small parts. Inspect the toys on a weekly basis (more often if needed). If there is anything wrong with the toy, throw it away immediately and replace it. Try some of these ferret toy ideas today–Give your ferret some enrichment fun! Click on the links to find some great toys! This is a great informative article! I learned quite a bit about ferrets while reading through it! It is well written and stays to your point. A wonderful site! Thanks, Harper. I’m glad you liked the article and the site. Stop by anytime! Thanks for the article. It is really interesting. Ferret seems to be an atypical pet, but maybe it is going to be more typical. Thanks for visiting, Andrew. Actually ferrets are now the 3rd most popular pet in the U.S! I have never owned a ferret but I have friends that do. I liked and shared your page on facebook so hopefully some of them will come looking for you! There was a lot of practical and useful information on here. I hope some of my friends stop by! Resourceful page! Keep it up!